Another week of collages and I love, love, love this project! It is super fun to know where you should focus. It helps me a lot. Also it helps to do the big announcement of a 365 project instead of just trying to create “more” collages! It was super-duper fun to read all your lovely comments on collages week 1! Thanks for letting me know which of the seven collages you liked best (and least)! Please let me know this week too? Hover over the image to know the title of each collage! Birch and Beyond… Love coming up with fun titles, at least most are fun to me. Some are secret messages, some are a play with words. Which of these is your favorite – and why? Also, how is your project coming along? 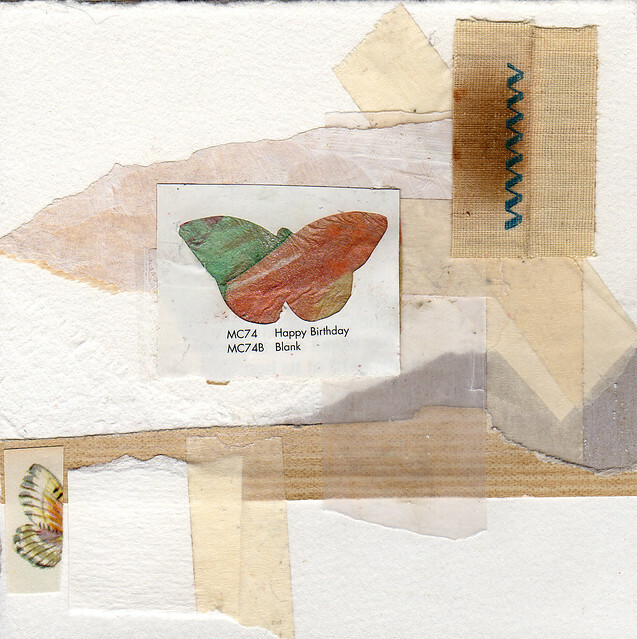 This entry was posted in Collage and tagged 365in2013, collage artwork. Bookmark the permalink. Tänkt att jag fortfarande inte har fått något collage i present! ;) Som jag väntar på det, att få rama in och hänga på väggen. Birch and Beyond gillar jag väldigt mycket! I’m so glad you put it out there that this is your goal and encouraged others to join. 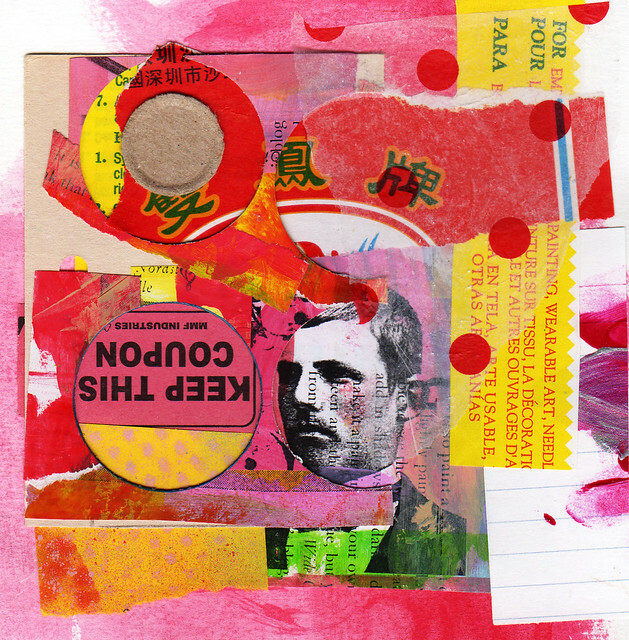 I’m happily making a stack of collages/mixed media pieces too and just loving knowing that I have all year to explore all sorts of themes – and yet I’m committed to having 365 at the end of the year. I like all of this week’s offerings but my fave might be Kitty Bitty because it looks like it’s layers of an old, crumbling wall with bits of layers of old wallpaper coming through. I really like the excavated look of it. I’m playing along whole heartedly! Kitty Bitty is my favourite, but they are all very nice! I’m joining in your 365 collages in 2013-challenge. I love the idea. Glad to see you updating us here :) I have two favs this week – the second one with a lady, and then the pale one with butterfly. Should you be interested – pop over to have a look at mine :) I was playing with numbers this week :) Thanks! I love lady on time and birch and beyond. I agree the Kitty bitty reminds me of all the yumminess found behind peeling wallpaper. Good description! These all turned out nicely. Love your determination to try and get one done every day. I really can’t pick a favorite as there is some little element in each that I love dearly! I sort of wish I hadn’t chosen something so strange for my 365 project but it’s too late now I think to change course. I am totally inspired by all the 365 work I’ve seen here, at Tammy’s and the Flickr group! 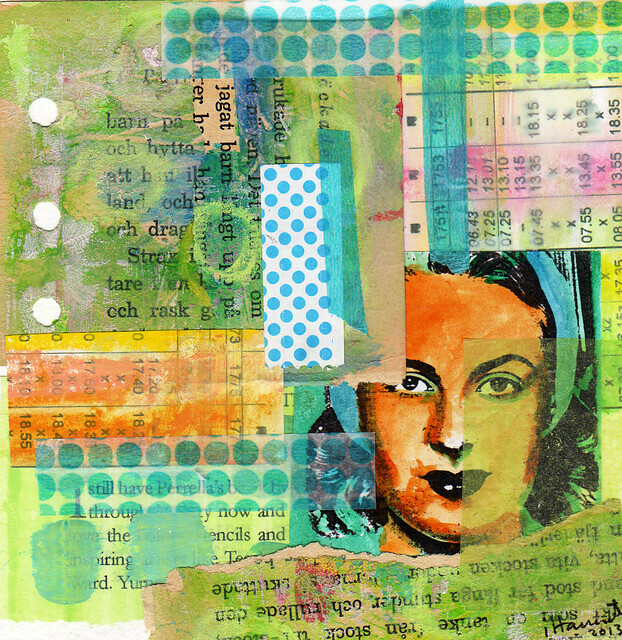 Again I have 2 favorites: Lady on time–I love the way she’s partially hidden behind some of the collage and I really like the turquoise dots repeated and the large text. 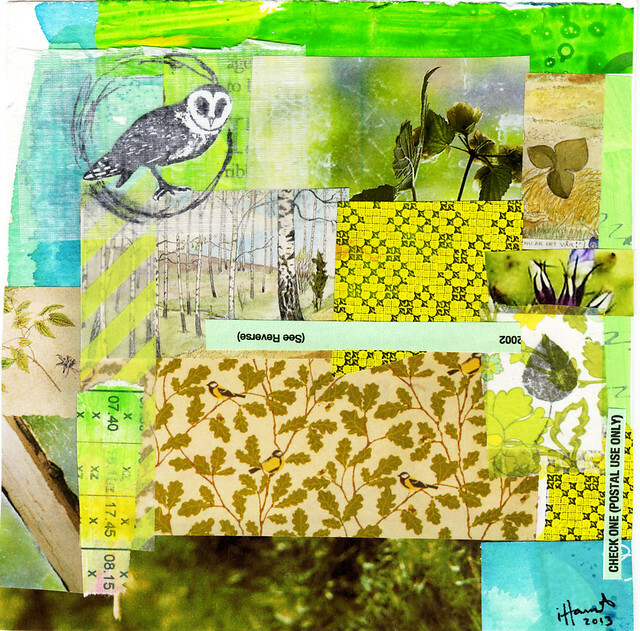 Birch and beyond–Again I am so partial to green but I do like the variety and the placement of the collage pieces and the birds/trees theme. Such colorful exciting work! I like the first 3 best. I like the use of the faces. Already, there is a maturing in your art after just starting this project! It’ll be fun to see how this all develops. Good work! Wow, Hanna! These collages are simply stunning. Good work! Its colors, composition, and all. How do you do it!!! Happy Butterfly to you might be my fave with it’s muted colors and wonderful variety of textures. And I like the composition of it with the empty spaces in it. but I’m also quite taken with Lady on Time. I was working steadily on my own project, but then got sick and did nothing for four days. Today schools are closed because of snow and I finally feel better, so I expect a flurry of collage activity! I love the last one, the colors are so vibrant!!! 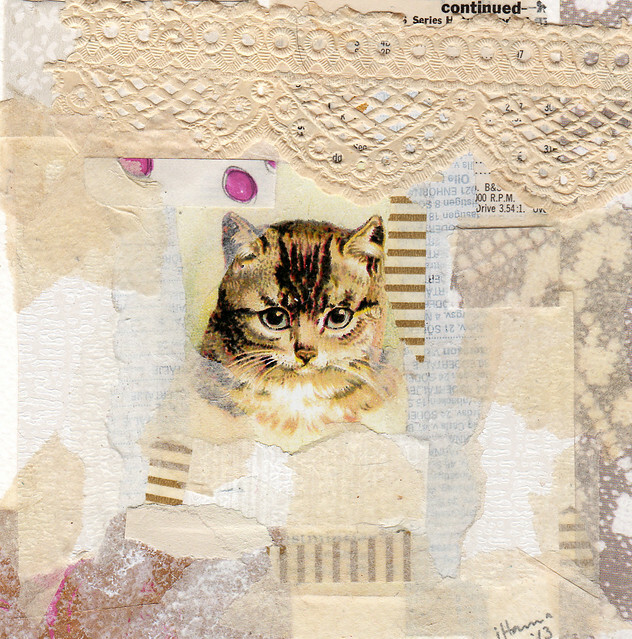 I really like your method of collaging… beautiful, Hanna. I am learning so much, Hanna! I hope you are having a great new year. 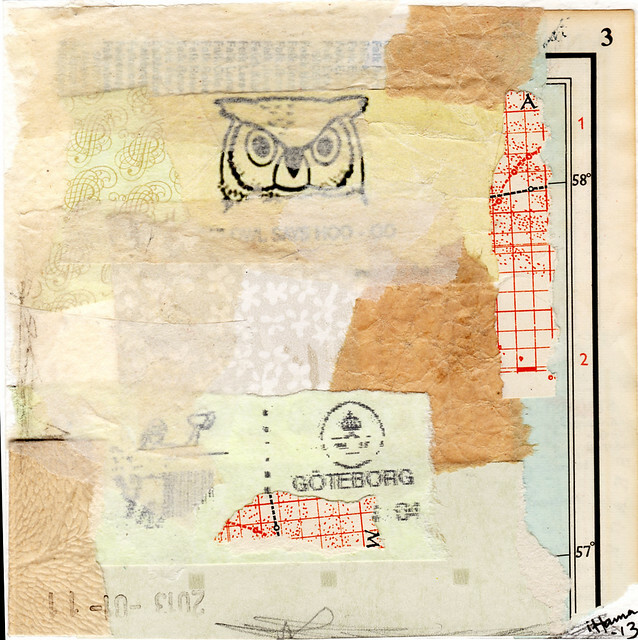 I shared my first collages on my blog. I look forward to a big weekend of small relaxation! I really like “Lady on time” because of the colors and polka dots. I also really like the colors in “Birch and beyond.” Blues and greens are my favorite colors, so if left to my own devices everything would end up that color! I am a little behind in my own 365 challenge… Only 6 books completed so far, but several in progress. I like Lady on Time, but they are both great. I tend to like the blues and greens more. Oh, I just saw Birch and Beyond. That one’s awesome! 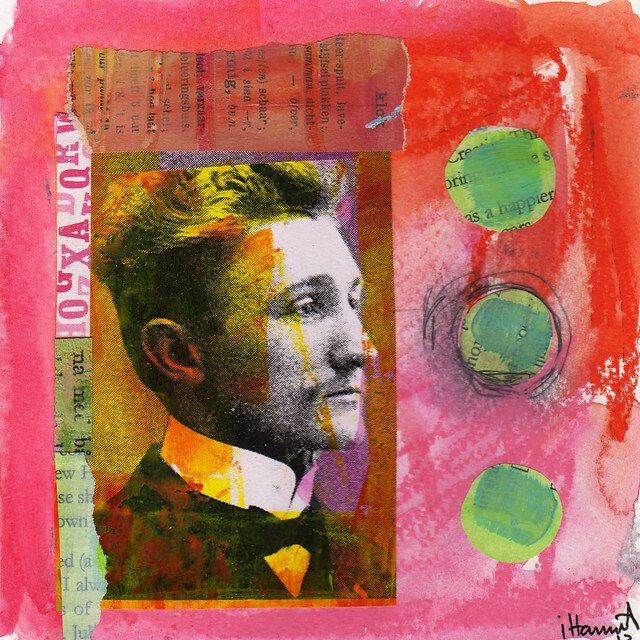 Hello Hanna….I am a big fan of collage….your collages are so wonderful…love the compositions that you have created!!! These are all just great Hanna! I’m yet another fan of Birch and Beyond. I love the colours and balance of textures. I’ve been playing along too and am having a blast. You got me out of my November-December slump…thank you! Your Collage is amazing, a great piece of art. Love the colours!